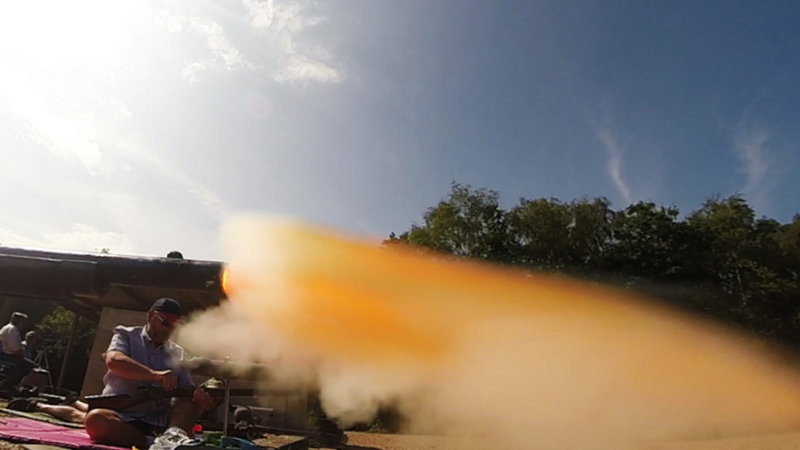 These are some preliminary results from using a GoPro® 3+ Black Edition to record an Enfield 0.577 rifle (in this case an original Volunteer edition) firing. The camera was initially set to record at ‘Protune’, resolution of 750, 120 fps. which, when edited turned out to be 100 frames per second; it was later set to 240 fps (see LINK). The camera was placed approximately 0.25 m to the left of the tip of the rifle. The wide angle nature of the GoPro lens provided a wide field of view, but as will be discussed, perhaps the camera should be placed further away. 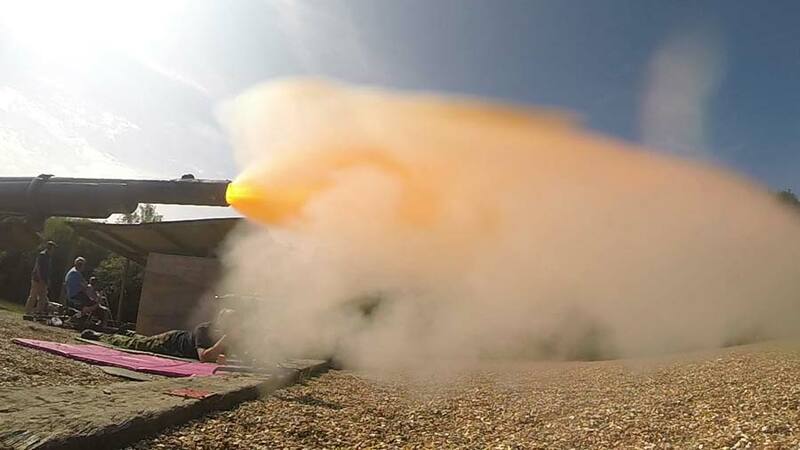 Each firing sequence occupied approximately 2 minutes, and involved tripping the release, placing the camera safely in position, settling down to take the shot, aiming, holding, firing, following through, retrieving the camera and turning it off. Safety was paramount and at no time was the camera set-up whilst other shooters were firing close either side. In future the camera could be semi-permanently set in place for a sequence of shots and triggered by the WiFi remote, but at this stage it WiFi was not used as the position of the camera was yet to be determined. An IPad, ‘phone, or like could also be used to monitor the shot using the WiFi connection from the camera. Various sources provide slightly conflicting muzzle velocities for this type of rifle ranging from 270 m/sec (900 ft/sec) to 390 m/sec (1274 ft/sec). Given that the editing processes allowed 100 frames per second to be examined meant that the distance the bullet traveled between frames ranged from 2.7 to 3.9 m. This distance is critical in respect to recording a bullet’s potential flight in that if the camera were too close to the muzzle the field of view would be insufficient to record the ten millisecond flight distance of 2.7-3-9 m. In these preliminary tests the camera captured approximately 0.75-1.0 m. which meant that depending on the bullet’s position it could be out-of-shot (no pun intended). Subsequent tests will involved moving the camera further to the right in order to capture 4 m. of flight. The only downside to this is the loss of detail when having to zoom-in on the image which; because the camera is further away resolution will be reduced, but probably not significantly. The videos were examined using Photoshop® CS6, concentrating on the second before the gun fired to the couple of seconds or so after. The actual time taken between the first signs of the explosion to the disappearance of the flame was approximately 25 milliseconds i.e. three frames. Following the flame’s disappearance the smoke rolled on and various bits of debris continued to emit from the muzzle for up-to a further 100 milliseconds. Various Photoshop® filters and techniques were used to enhance the stills captured from the video at 10 millisecond intervals. These included some initial lens correction (the GoPro® has a very wide-angle lens which leads to noticeable distortion) tweaking the image size (pixels), curves, reducing noise and sharpening. 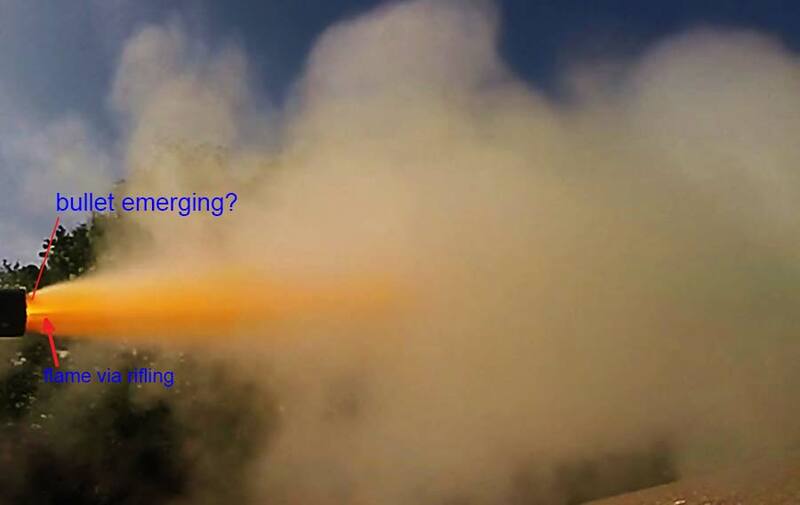 Propellant – being black-powder the shear volume of flame and smoke potentially hides the projectile. Distance bullet travels in one frame, 2.7-3.9 m – means that many shots are needed in order to try and capture the bullet and explosion at different times during a shot; with 10 millisecond between frames means the bullet could be any where within the 2.7 – 3.9 m range. Despite filming only a dozen shots there are indications that something can be gained from using this albeit, primitive simple set-up. The duration of the main flame is always clearly captured because it lasts for a relatively long time, 25 milliseconds, and so a ‘frame’ can bracket the flame, but the bracketing can occur at any time. It might catch the flame just emerging or when it has extended to its full extent which appears to be well over a metre. 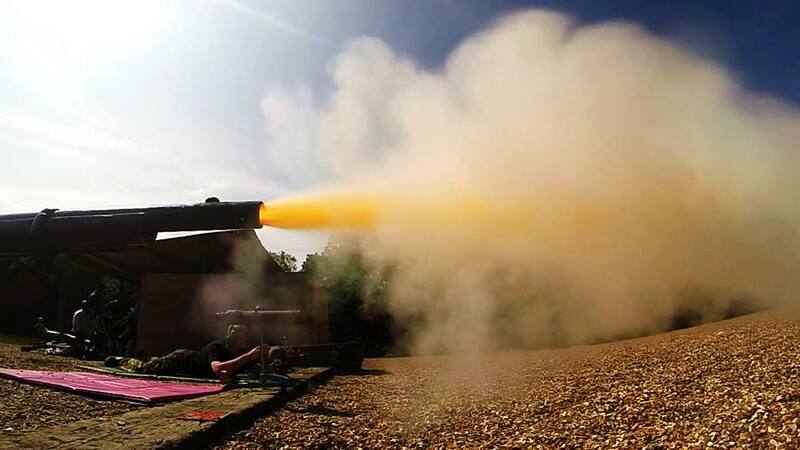 The closest image recorded of the gun firing was this one where the barrel is blurred, jerking back 3 mm under recoil, before the flame left the barrel. 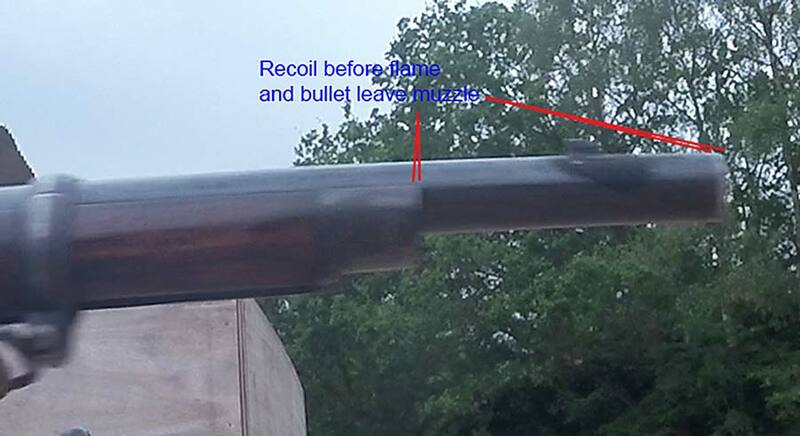 Other images of the muzzle flash with the bullet hidden within the cloud of flame and smoke or, in some cases, more likely beyond the field of view to the right (hence the need to move the camera further back to capture a wider (up to 4 m.) distance from the muzzle tip. This could be a result of a bullet leaving at an odd angle for what-ever reason compounded by a slightly distorted lens effect. Further shots needed. 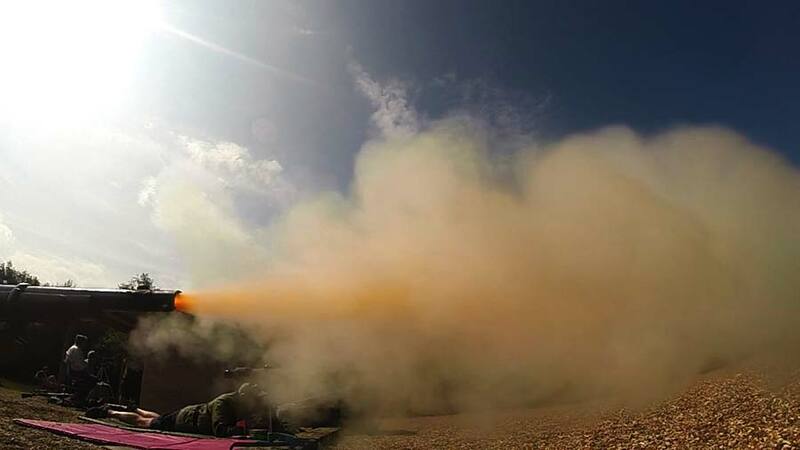 Using the GoPro™ to attempt to record what happens in the milliseconds after squeezing the trigger shows what potentially can be done to capture those important moments. I hope that this introductory account will lead to further investigations and prove interesting to those who like charcoal burners.